Preface. List of Contributors. I. Signalling via nucleotides in the nervous system. 1. Current status of purinergic signalling in the nervous system (G. Burnstock). 2. Modulation of purinergic neurotransmission (P. Sneddon, T.D. Westfall, L.D. Todorov, S. Mihaylova-Todorova, D.P. Westfall, C. Kennedy). II. Molecular biology of P2Y receptors. 3. Molecular biology of P2Y receptors expressed in the nervous system (T.E. Webb, E.A. Barnard,). 4. P2Y receptors in the nervous system: molecular studies of a P2Y2 receptor subtype from NG108-15 neuroblastoma x glioma hybrid cells (G.A. Weisman, R.C. Garrad, L.J. Erb, C. Santos-Berrios, F.A. Gonzalez). 5. Nucleotide radiolabels as tools for studying P2Y receptors in membranes from brain and lung tissue (G. Reiser, W. Laubinger, R. Schäfer). III. Molecular biology of P2X receptors. 6. Evolving view of quarternary structures of ligand-gated ion channels (A. Nicke, J. Rettinger, C. Büttner, A. Eichele, G. Lambrecht, G. Schmalzing). 7. Cloning, functional characterization and developmental expression of a P2X receptor from chick embryo (A. Ruppelt, B.T. Liang, F. Soto). IV. Development of nucleotide analogues. 8. Developments in P2 receptor targeted therapeutics (M. Williams). 9. Novel ligands for P2 receptor subtypes in innervated tissues (G. Lambrecht, S. Damer, B. Niebel, S. Czeche, P. Nickel, J. Rettinger, G. Schmalzing, E. Mutschler). 10. Molecular recognition in P2 receptors: ligand development aided by molecular modeling mutagenesis (K.A. Jacobson, C. Hoffmann, Y.-C. Kim, E. Camaioni, E. Nandanan, S.Y. Yang, D.-P. Guo, X.-D. Ji, I. Von Kügelgen, S. Moro, A.U. Ziganshin, A. Rychkov, B.F. King, S.G. Brown, S.S. Wildeman, G. Burnstock, J.L. Boyer, A. Mohanram, T.K. Harden). V. Release of nucleotides. 11. Release of ATP and UTP from astrocytoma cells (T. K. Harden, E.R. Lazarowski). 12. Quantal ATP release from motor nerve endings and its role in neurally mediated depression (E.M. Silinsky, J.K. Hirsh, T.J. Searl, R.S. Redman, M. Watanabe). 13. Receptor- and carrier-mediated release of ATP of postsynaptic origin: cascade transmission (E.S. Vizi, B. Sperlágh). VI. Presynaptic modulation by nucleotides of neurotransmitter release. 14. P2-receptors controlling neurotransmitter release from postganglionic sympathetic neurones (I. Von Kügelgen, W. Nörenberg, H. Koch, A. Meyer, P. Illes, K. Starke). 15. Adenine nucleotides as inhibitors of synaptic transmission: role of localised ectonucleotidases (A.M. Sebastião, R.A. Cunha, J.F. Cascalheira, J.A. Ribeiro). 16. The functions of ATP receptors in the synaptic transmission in the hippocampus (K. Inoue, S. Koizumi, S. Ueno, A. Kita, M. Tsuda). VII. Physiology of nucleotide function. 17. Electrophysiological analysis of P2-receptor mechanisms in rat sympathetic neurones (W. Nörenberg, I. Von Kügelgen, A. Meyer, P. Illes). 18. P2 receptor-mediated activation of noradrenergic and dopaminergic neurons in the rat brain (H. Kittner, U. Krügel, W. Poelchen, D. Sieler, R. Reinbardt, I. Von Kügelgen, P. Illes). 19. ATP receptor-mediated component of the excitatory synaptic transmission in the hippocampus (Y. Pankratov, U. Lalo, E. Castro, M.T. Miras-Portugal, O. Krishtal). 20. Nucleotide and dinucleotide effects on rates of paroxysmal depolarising bursts in rat hippocampus (F.M. Ross, M.J. Brodie, T.W. Stone). VIII. Physiology of nucleoside function. 21. The function of A2 adenosine receptors in the mammalian brain: evidence for inhibition vs. enhancement of voltage gated calcium channels and neurotransmitter release (F.A. Edwards, S.J. Robertson). 22. An adenosine A3 receptor-selective agonist does not modulate calcium-activated potassium currents in hippocampal CA1 pyramidal neurons (T.V. Dunwiddie, K.A. Jacobson, L. Diao). 23. Brain hypoxia: effects of ATP and adenosine (K. Nieber, D. Eschke. A. Brand). IX. Nucleotide effects on neuronal differentiation and glial proliferation. 24. Adenosine and P2 receptors in PC12 cells. Genotypic, phenotypic and individual differences (G. Arslan, B.B. Fredholm). 25. Nucleotide receptor signalling in spinal cord astrocytes: findings and functional implications (C.J. Gallagher, M.W. Salter). 26. Trophic signaling pathways activated by purinergic receptors in rat and human astroglia (J.T. Neary, M. McCarthy, A. Cornell-Bell, Y. Kang) 27. Signalling mechanisms involved in P2Y receptor-mediated reactive astrogliosis (M.P. Abbracchio, R. Brambilla, S. Ceruti, F. Cattabeni). X. Immunomudulatory effects of ATP. 28. Purinoceptors in human B-lymphocytes (F. Markwardt, M. Klapperstück, M. Löhn, D. Riemann, C. Büttner, G. Schmalzing). 29. The P2Z/P2X7 receptor of microglial cells: a novel immunomodulatory receptor (F. Di Virgilio, J.M. Sanz, P. Chiozzi, S. Falzoni). XI. Ecto-nucleotidases and ecto-protein kinases. 30. Ecto-nucleotidases-molecular structures, catalytic properties, and functional roles in the nervous system (H. Zimmermann, N. Braun). 31. Immunolocalization of ATP diphosphohydrolase in pig and mouse brains, and sensory organs of the mouse (A.R. Beaudoin, G. Grondin, F.-G. Gendron). 32. Diadenosine polyphosphates, extracellular function and catabolism (M.T. Miras-Portugal, J. Gualix, J. Mateo, M. Díaz-Hernández, R. Gómez-Villafuertes, E. Castro, J. Pintor). 33. Ecto-protein kinases as mediators for the action of secreted ATP in the brain (Y.H. Ehrlich, E. Kornecki). Subject Index. The study of purinergic mechanisms has for long been focused on the actions of the nucleoside adenosine, whereby the contribution of nucleotides to the signaling systems has been underestimated. 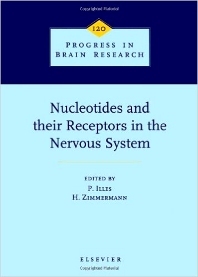 Based on the proceedings of a IUPHAR Satellite Conference held in Leipzig, Germany, this book offers a comprehensive update and overview of nucleotide release, the structure and function of nucleotide receptors, nucleotide-metabolizing ecto-enzymes as well as the physiological functions of nucleotides in the nervous system. The physiology and molecular biology of receptors for ATP and other nucleotides are examined, as are the physiology and molecular biology of enzymes that hydrolyze extracellular nucleotides. At present, a pharmacology of the nucleotide signaling system is being developed. Of particular interest is the production of receptor subtype-specific antagonists and of drugs that selectively affect the extracellular lifetime of the nucleotide. An excellent source of reference for institutes of pharmacology, biochemistry, neurology, zoology, and physiology, and for the pharmaceutical industry.